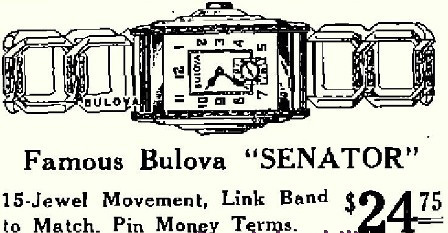 1935 Senator in white 10K rolled gold with Bulova and Shield on back edge. Movement is double date stamped with a triangle over a circle. Keeping time. Referenced ad dated 1935. Bob, very nice "Senator" with the original band. Nice find Bob. I would agree with Senator, but I don't think an advert has been found showing the engraved bezel. Thanks, Ken. As far as I know we have no ads showing the engraved case, but have always been in agreement that this is a Senator variant. 1935 Bulova Senator works for me! Very nice! I think the band you add looks great.